She was born Cathaline Kaesuk Sur in Seoul, Korea, in 1933. Her married name became Hardwick. She studied music in Korea and Japan before moving to the United States as a teenager in the early 1950's. She has three children, one daughter who lives in California, one daughter in Paris, and a son Anthony born in 1966. She fell into fashion design by accident. She made bikini swimsuits for her friends and offered one to a store in San Francisco, who ordered 1,000 for immediate delivery. She opened a boutique in San Francisco, then worked as a freelance designer before moving to New York in 1972 and opening her own salon. She worked with the design team of Joan and David in the 1980's. She has also given advice and training to several up-coming designs like Gemma Kahng who was with her from 1979 for several years. She took a break in the 1980's to concentrate on her family, then formed the Cathy Hardwick Company in 1985, which makes $ 20 million per year. 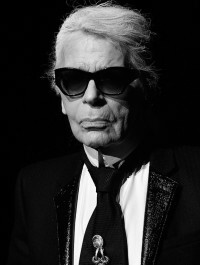 Tom Ford was Cathy Hardwick's chief designer from 1986 to 1988, when he joined Perry Ellis and later Gucci. The collection of 1987 by Ford, was particularly noted which introduced long denim skirts with slide slits up to the thigh, that were very popular. Cathy has several homes around the country, but mostly lives in her Park Avenue apartment in New York. She was married to Tom Snowdon, who worked with her to set up her various businesses. They were divorced in 1998. She lives in Florida for the winter, and in 2002 threw a party to launch the book on Bill Blass which was attended by all the fashion celebrities. Hardwick designs adventurous clothes which often fuse elements of East and West. Traditional Korean clothing has inspired many of her simple shapes. She is especially noted for her creative handling of silk. Cathy Hardwick has designed ready-to-wear for the audience she knows best—the modern career woman with an active lifestyle. There is a certain spirit and success about Hardwick's designs that come from this defining relationship to the clothing and its purpose. Hardwick's collections consistently offer women clothing with ease and simplicity, appealing to the young and young-minded spirit of the confident, self-assured businesswoman. Her clothing is not merely a somber uniform, but rather has an air of wit and sophistication that makes it fun, worn by the stylish young woman who is secure with her life and is moving in a positive direction. Hardwick's design success has been a result of the masterful execution of her pure and basic principles—neutral colors and simplicity of form. By centering her collections around neutral colors and relating the colors of current collections to previous ones, the wearer can develop a wardrobe of pieces that work together. Her designs recognize fashion trends but always retain a clean, simplistic style that is distinctly her own. Hardwick's clothing is associated with the modern woman's ability to go from an effective day at work to an evening out with minimal changes. Based on strong, simple shapes reminiscent of traditional Korean clothing, Hardwick's collections hard back to her childhood. Her clothing reflects her lifelong exposure to and depth of understanding of the fusion of Eastern and Western styles. The chinoiserie elements in the designs seem to be a part of the total vision and philosophy she has about clothing rather than a motif simply applied to Western fashion. 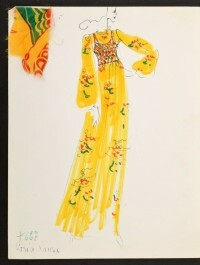 In her first formal show in New York in 1974, Hardwick showed obi style wrapping in the closures of her skirts and trousers along with Oriental prints and accessories. In 1975, she showed the effectiveness of shaping a "Big Dress" with an obi-inspired tie. Earlier Hardwick incorporated frog closures in her mandarin collared jacket for a more direct use of the Eastern look. The mandarin collar and frog closures were used again in her spring 1994 collection on light and easy shaped tops.